Carriers | The Small Wave. I just received the above email from AT&T regarding my iPhone 4. This is odd. You see, my order was taken at an AT&T Store the first day pre-orders were allowed. I received confirmation the next day, and a tracking number a couple of days after that. The device was delivered right on schedule June 24th, and getting it activated (a “swap” with another phone on our family plan) was easy as well. In short, AT&T rocked for me through the whole process. Sending me an email now saying I’m not going to receive the phone I’ve already had for six days is not going to bring me down. Confuse me, yes, but bring me down, no. Some of the cause for the updates is likely to be HTC, which only said 2010 phones would be updated. As such, the only HTC phones on Sprint to carry Android 2.2 are likely to be the Evo 4G and possibly the Legend. Samsung hasn’t explained any of its plans for the Moment, but the company has developed a pattern of declining to upgrade phones beyond one revision. Only phones from 2010? Only one revision? Wow. That’s some harsh upgrade terms right there. And don’t think other hardware manufacturers and carriers will think any different. For all the good press Android 2.2 has received, little has been written about the tiny percentage of phones that are actually going to run it. The vaunted Evo doesn’t have it yet. Even unreleased phones like the DroidX will debut with 2.1. Notice that there isn’t just one upgrade villain. Various manufacturers and carriers will have their own rules about what’s happening. Too bad for the user who wants to upgrade but realizes the decision is not his. Still, this is what Google wrought by design. Their goal is to get as many “Androids” out there as possible. Version consistency is not a priority because they all display Google’s mobile ads, which is the entire point of Android in the first place. Though disappointed by this, I’m not surprised. I’ve compared the Android distribution philosophy to Windows Mobile before, and this is more proof of it. Sure, Android is better than WinMo, but saying you run “Android”—unless you’re a geek—doesn’t tell us much because of the many hardware/software iterations. Typical users will be running the original version that came on the phone two years later when they buy a new one because upgrading was too much trouble, or they didn’t know they could, or it wasn’t an option. The more Android devices sell, the more this will be true. The carriers and manufacturers are too busy with the latest spec sheet-based offering (10 megapixels, anyone?) to worry about the user who bought one three months ago. Compare this to the iPhone. Much is made of Apple’s yearly iOS introductions, with critics claiming it’s all hype or they’re just catching up. I disagree, but none of that matters. What matters is that every year iPhone owners get an upgrade that significantly improves their existing phone and it costs them nothing. They just plug into iTunes and click Install. Further, only with iOS 4 has Apple finally dropped a device. But that original iPhone is three years old, and was already “made new” twice; we’re not talking about an HTC phone bought seven months ago. The reason iPhone owners watch Apple’s new iOS announcements closely is because they know their phone can upgrade to it. Meanwhile, Android users excited by 2.2 a month ago are still waiting, most likely to be disappointed. AT&T To Allow Phone Number Swapping For iPhone 4 Without A Store Visit? However, if the number you used to order your device is NOT the number you intend to use with your iPhone 4, follow these simple steps when your device arrives and an ATT representative will help you activate. I bought my iPhone 4 using an eligible number on our family plan with the intent of swapping it to my number after activation. The eligible member of the family would end up with my 3GS; I’d get the 4. AT&T has no problem with this. In fact, it’s written in the purchase receipt and confirmation email that if you plan to swap phones you just have to bring both of them into a store after the new one is activated. However, today we got a text message from AT&T linking to the above page. It seems AT&T has set it up so that phone swapping can be done over the phone, there’s no need for a store visit. Cool! Will this work? I never know if AT&T’s ideas, even the good ones, will get implemented right. Obviously, I’ll follow the procedure and see what happens. Worst case scenario is I go to the store and wait in line like I’d already planned to. Doing it over the phone would sure be nice, though. AT&T’s new data rates go into effect tomorrow. While there’s a lot of complaining about it, I think most of it’s knee-jerk. Bottom line is iPhone users are no longer required to pay $30 a month for unlimited data they’ll never use. Instead, starting tomorrow you pay either $15 a month for 200MB, or $25 a month for 2GB. I’m considered a pretty heavy data user, but see the chart above. I can easily go with the 2GB plan and have a ton of room left under the cap. That’s $5 a month saved. As for the other two members of this household, their charts show a highest monthly usage of 91MB, so they’ll get the 200MB plan with plenty of room to spare. That’s another $30 a month saved. A major reason I get by with the cellular data usage I do is that AT&T’s free WiFi hotspots are at Starbucks and other popular locations. This is a huge benefit, and the iPhone always connects to it flawlessly. Without those free hotspots my data usage would probably quadruple, but it’d still be under the cap. Imagine if the plan change was reversed. You were paying for the data you used, and suddenly AT&T required everyone to pay $30 a month no matter what. As a “reward” you’d get unlimited data. When you only use 90MB a month you’d be furious. There’d be cries about greed like you never heard before. 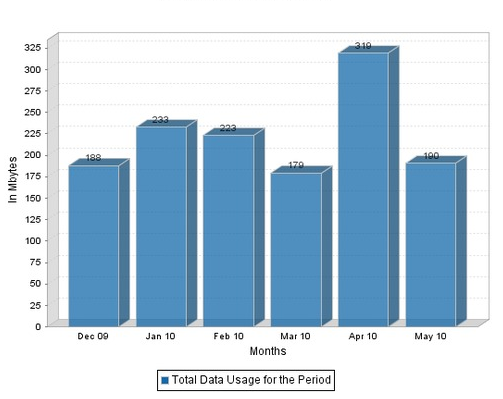 People need to step back, take a look at their actual data usage, and relax. They should also consider that this is a bold move by AT&T to start pricing smartphone data so more people can join the party. Overall this is a good thing for consumers and smartphone makers. AT&T: Some of our users still like us, let’s fix that. AT&T… said it would raise the early termination fee on smartphones — including the iPhone — to $325 from $175 as of June 1. When AT&T appeared not to follow Verizon’s lead in jacking up ETFs I was hopeful. But now they’re doing it, and including the one phone that single-handedly saved their asses by keeping them in the game, yet for which they still don’t allow tethering. Morons. And by that time 2.2 might be here, so your phone will still be out of date.